Aziz Huq of the University of Chicago Law School addresses University of Houston Law Center students and faculty during a presentation in the Hendricks Heritage Room. 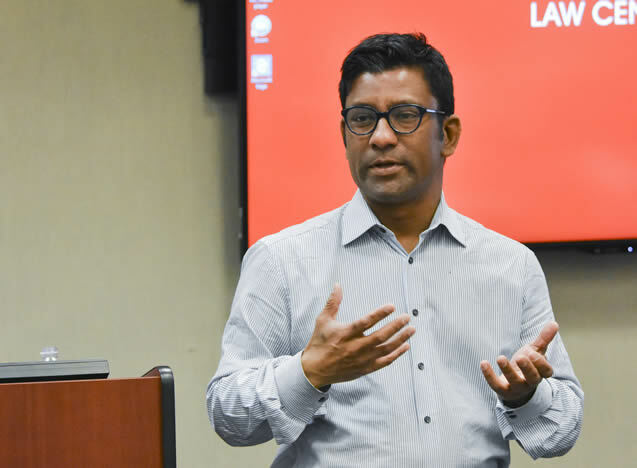 April 15, 2019 - University of Chicago Law School professor Aziz Huq suggested that machine-made legal decisions can potentially make a positive impact on the legal system during a presentation last week in the Hendricks Heritage Room at the University of Houston Law Center. "Algorithmic technologies used by machine decisions are still in their infancy, and they can be flawed in many ways," Huq said. "It seems too early, however, to assume that human decisions will be globally superior to machine decisions. Sometimes the opposite might be true, provided the algorithm is well-calibrated, carefully trained, and regularly adjusted. “We should, therefore, at least consider the possibility that under certain circumstances a right to a well-calibrated machine decision might be the better legal design choice." Huq acknowledged that recent advances in technology have caused concerns about the shift of power from human to machine decision-makers. "From prison sentences to loan approvals to college applications, corporate and state actors increasingly lean on machine learning tools to allocate goods and to assign coercion,” he said. “Machine-learning tools are hence perceived to be eclipsing and even extinguishing human agency in ways that sacrifice important individual interests. "An emerging legal response to such worries is the right to a human decision. European law has already embraced the idea in the General Data Protection Regulation. American jurisdictions, including California and Wisconsin, are moving in the same direction. But no jurisdiction has defined with precision what that right entails, or furnished a justification for its creation."